Al Remetch runs his own business on top of a 40-hour week at his "day job"
iReport.com: Do you ever get a day off? (CNN) -- Kevin Fernandez says he'll do whatever it takes to make sure his family is happy and healthy -- even if that means never taking a day off from work. 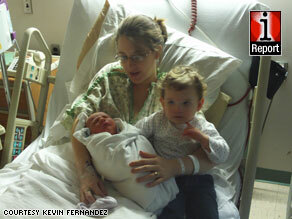 Kevin Fernandez works seven days a week to support his wife and two children, pictured here. Fernandez has a full-time job with FedEx corporate in Pittsburgh, Pennsylvania, where he trains managers from around the country. He also spends every weekend and up to two other nights working at a local grocery store. He says working 7 days a week takes its toll. "It's very hard," he said. "Like right now, I'm holding my 6-week-old baby, and there's only a few nights a week I actually get to see [my family]. I have an 18-month-old daughter upstairs going to bed." Fernandez originally took on his grocery store job so that his family could start building up their savings. But in December, he says "the bomb dropped." FedEx announced that they would be reducing his salary and cutting its contributions to employee 401(k)s. It was then he knew that he would need that extra income -- along with his "meager savings" -- just to pay the bills, and that he wouldn't be getting a day off any time soon. Still, Fernandez says he's grateful to have a job at all, let alone two jobs. "I think what they did with reducing our wages was great. I'd take another pay cut if that meant nobody else got laid off. [FedEx is] a great company and I love working for them," he said. "But it still hurts in the pocketbook." For Fernandez, his family is top priority. His wife is a stay-at-home mom who cares for their two young children, and he says that her getting a job is not an option. "We decided a long time ago that once we had kids, that one of us needed to stay home. Day care just wasn't for us," he said. And he's more than willing to do whatever it takes to make sure that his wife can stay home and that their family is taken care of. Hash works 40 hours a week in sales at an electrical distributor. He then puts in another 20 to 25 hours working at a high-end speaker store. Like Fernandez, he's glad that he was able to find and keep two jobs. He even sees an extra benefit in it: He can save more money because never taking a day off means he has less free time to spend it. "I told myself the more I work, the less time I have to spend money. If I wasn't working every weekend, I would be out blowing money at bars like most guys my age do," he said. "I don't regret working so much. I look at being able to have two jobs as a blessing, because in today's world some people can't even find one." Hash said he's not sure how long it will be before he's able to take weekends off, but for now, he definitely doesn't see himself quitting his part-time gig anytime soon. "I enjoy the feeling know[ing] I am supporting my daughter and supporting myself with out any help," he said. Even for those who don't have children to support, taking on extra work can help make ends meet and allow them to save a little money. Linda Ojeda teaches high school English and coaches sports teams at her school. She also works in a movie theater on the weekends. And on top of all that, she's a graduate student who's scheduled to get her Master's degree in December. "Not taking a day off is something that really hasn't crossed my mind too often," she said. "I do get tired and even fall a little sick sometimes, and I think that it may have to do with lack of rest, [but] being on the go all the time is something that has been surprisingly easy for me to adapt to." Ojeda sticks to a fairly strict schedule each day, including on the weekends, to fit everything in. She loves her jobs, and would like to continue her education even after she receives her Master's degree. Her weekend movie theater job, she says, is to make extra gas money and also to help out her parents financially. Her father is a carpenter, and she says it's been harder for him to find work since the recession. "I'm young enough to still be able to do this, and I don't have children or anything, so I can commit myself to doing this for awhile," she said. "The situation seems tough, and a lot of people say take a break. But I feel lucky right now that I'm able to handle myself and at the same time help out my parents, because when I was in college they really did help me out a lot." But, like Fernandez, Ojeda's commitment to her family has the ironic consequence that she's not able to spend as much time with them. Al Remetch also works every day, but on his own terms. He owns a small business in addition to his full-time "day job" in information technology. He says business for his company, which optimizes Google Maps listings for small businesses, is taking off. But to make it work, he says, "takes all of my time." When Remetch gets home from work during the week, he spends several more hours working for his own company. He makes a point to take Friday nights off, but weekends are devoted to his business as well. "It'd be great to have one job ... [but] I see myself doing this for quite awhile," he said. "Every entrepreneur has big dreams for this type of thing. I'd like to see the type of situation where I could basically quit the real job. I also see [owning a business] as a safety net. If something were to happen in the real job, it's something that I could continue with." Having two jobs allows Remetch to put more money away towards retirement, which he says is important because he and his wife are approaching retirement age and are heavily in debt. And while it takes up much of his time, he says a bonus of owning his own business is that he can work from home and on his own terms.